Unexpected, silly, oddly-specific. Oh, and pretty. 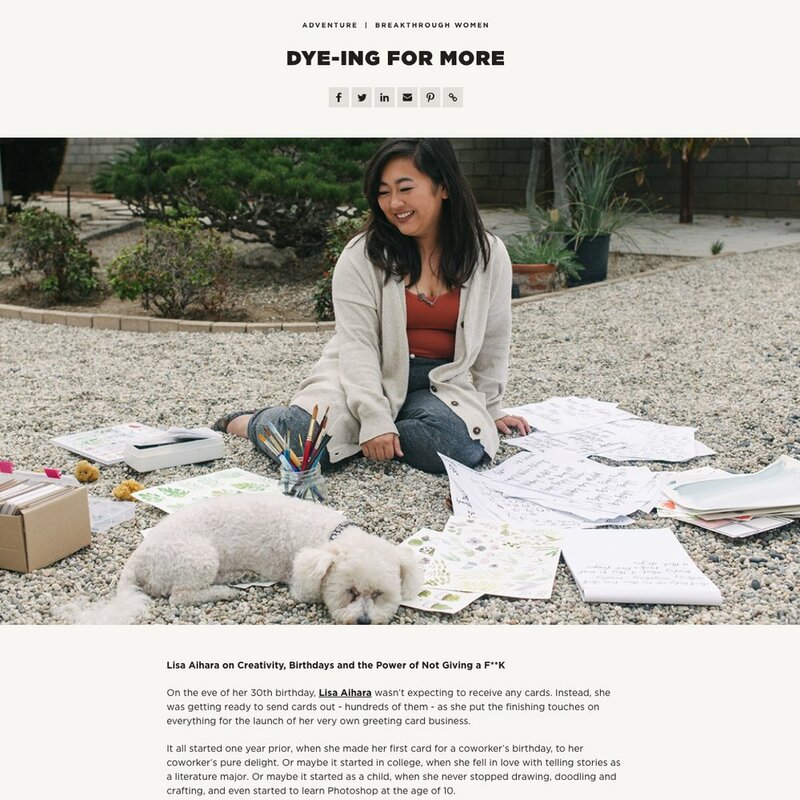 A writer, doodler, painter, illustrator, and all-around dabbler, Lisa Aihara started Fiber & Dye on her 30th birthday after years of loving pestering from friends and family telling her to find a creative outlet to flex her art muscle, if you will. Now you can add owner + artist to that list of titles. In August 2016 she launched the greeting card line with a few cards that featured her original artwork and text. Just like the gal who created them, Our designs are always cheeky and mostly cheerful, with its sentiments sincere but not without wit and cursing like a sailor. Never intended to be taken seriously because let's face it, she certainly don't take herself too seriously either. Unexpected, silly, oddly-specific. Oh, and pretty. 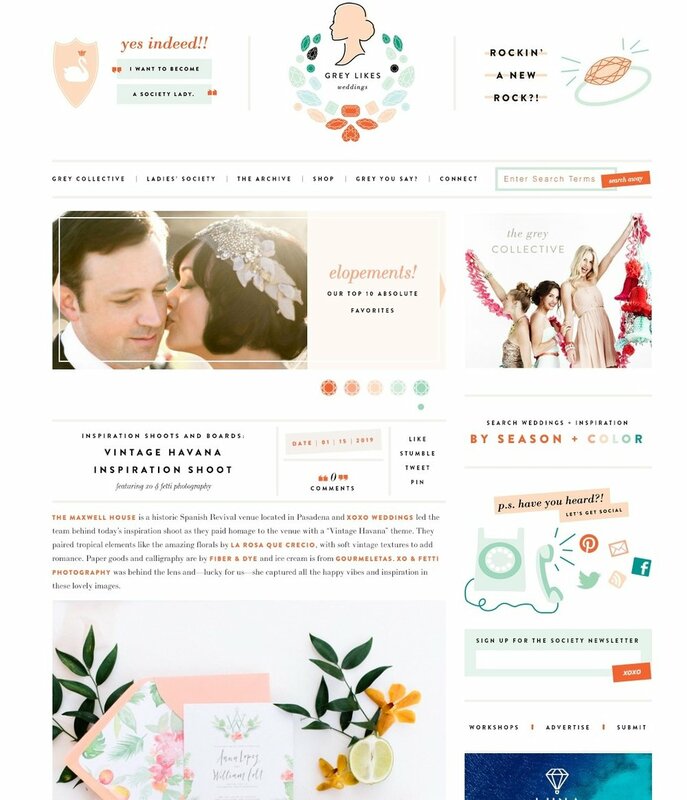 From stationery to custom wedding design to business branding, Fiber & Dye is a design studio for silly people who love pretty things—just like us. Lisa draws inspiration (pun intended) from the people in her life for her designs. For the greeting cards, they're intended to be that "aha" card, the one where as soon as you set your eyes on it you know exactly who you'll give it to. That's why they're all oddly specific, and not meant for every one. No generic sentiments here. Your stories are nothing but generic, so why would the cards we celebrate with be blah? We like to think that we're connecting BFFs with that one weird inside joke you two have. With that same mindset, we create custom wedding suites that tell your story as a couple and truly reflects the both of you, because you're about to invite your dear friends to the party of a lifetime, and the stationery should reflect you. Creative couples, come on over, let's put you on paper. Starting a business is hard. Keeping it going is even harder. Just ask us, we're living it every day. We want to celebrate with fellow boss ladies (and fellows) everywhere who did this crazy brave thing, but are struggling with the feeling that their branding isn't quite there. We're here to bring your strategic brand vision to life, so you could grow your business. Because you're already DOING great things, may as well LOOK great doing it. All Fiber & Dye designs are painted, written, lettered, and designed by Lisa. Watercolor has always been a medium that was special to her, because it was difficult and counterintuitive. It was an unforgiving medium unfit for frequent touch-ups, and forced her to be okay with the imperfections from organic strokes that she would instinctively want to "fix." Starting pointed pen calligraphy in 2014, brush lettering and hand drawn type has become a passion for her ever since. She believes that written text quite literally (pun intended) help to tell the story, strengthening, complementing, or juxtaposing against the images, and plays such a big part in that. So we don't use fonts to tell our story, nor clip arts. The calligraphy, watercolor, illustrations, and designs are done in-house, custom, by hand, all the time. Thank you for your note! If the message requires a reply, we will get back to you within 2-3 business days. Think tropical details, mango placecards… all the details that just make you happy. Our invitation and calligraphy were featured! Our invitation and calligraphy were featured on Green Wedding Shoes—think pretty pinks and purples, with the girliest of touches. Lisa was featured on VoyageLA as a Trailblazer, a series that highlights women who make a mark across industries in Los Angeles. Can you say DREAMY? Our invitation suite and calligraphy was featured on an Aisle Society Blog with DIY details, abstract watercolor, and fluffy clouds. Our invitation suite and calligraphy was featured on an Aisle Society Blog—think moody color schemes, boys club details, and lots of rich wood and leather. Lisa was a guest on the How to Fail! Podcast, talking failures, vulnerabilities, and owning your story. 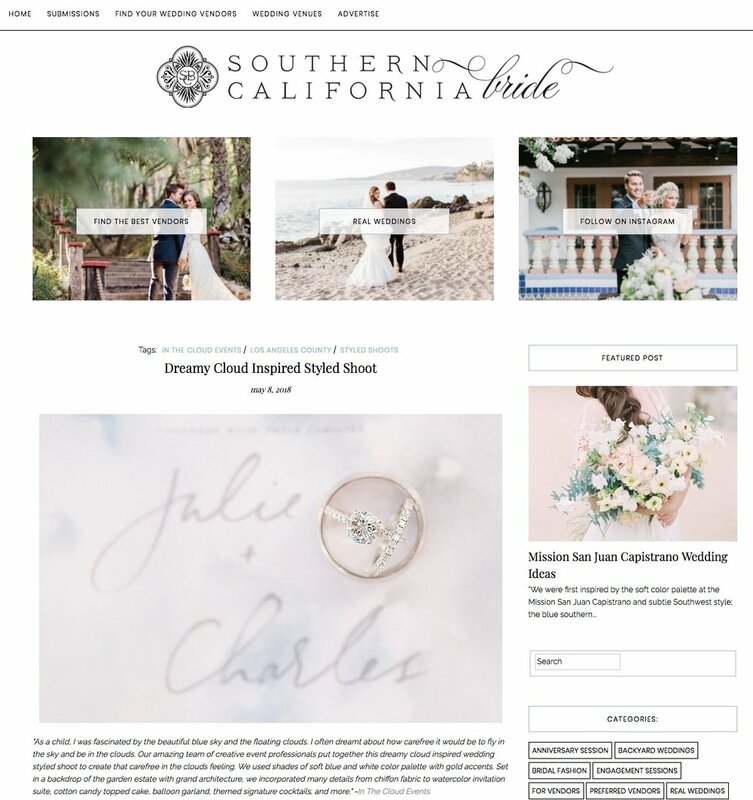 A styled shoot we were a part of was featured on an Aisle Society Blog and it's chock-full of mody details including our wedding suite, and chalkboard art. We participated in the Big Fake Wedding Los Angeles - 2017 for day-of paper goods and calligraphy. The photos were featured in Ruffled. Lisa was featured as a breakthrough woman in the LUNA Bar blog and discussed everything from creativity to side hustle, birthdays to puns, and the art of not giving a F**K.